I had a very quiet shift at Hatfield Forest this morning but fortunately a couple of the local robins popped by to keep me company. Naturally, I'd taken my new camera and long lens into work with me so I whiled away some of the quiet moments taking photos of my companions. I'm beginning to wonder if I'll ever get to use this lens in good light (I've had it three weeks and barely seen any sunshine!) but the pairing acquitted themselves well in today's gloom. Once again, the camera's image stabilisation worked a treat, especially when paired up with the long lens, where the two stabilisation systems work in tandem. Fingers crossed for some better weather soon so I can really have fun! I took my new camera for a thorough test drive today, with a trip into Cambridge. 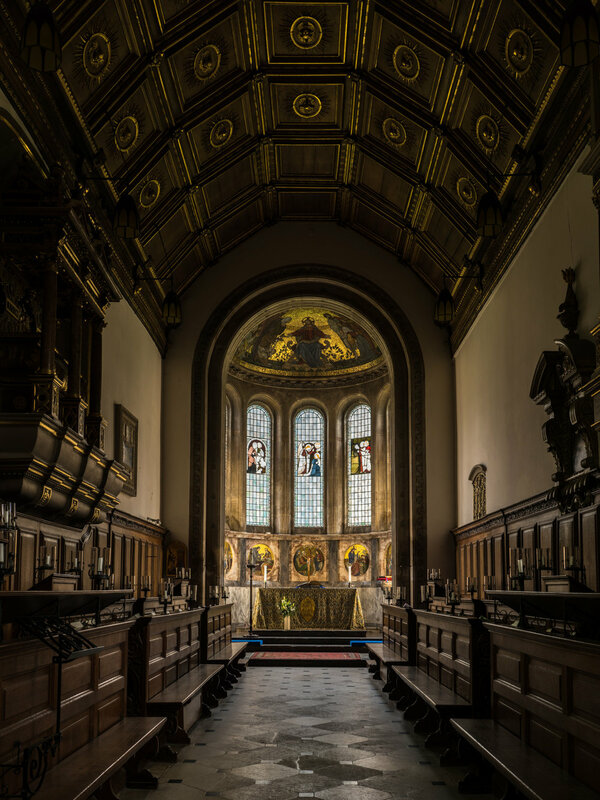 I was interested to get to know what the G9 is capable of so I headed first to Gonville and Caius College Chapel for some architecture photography. 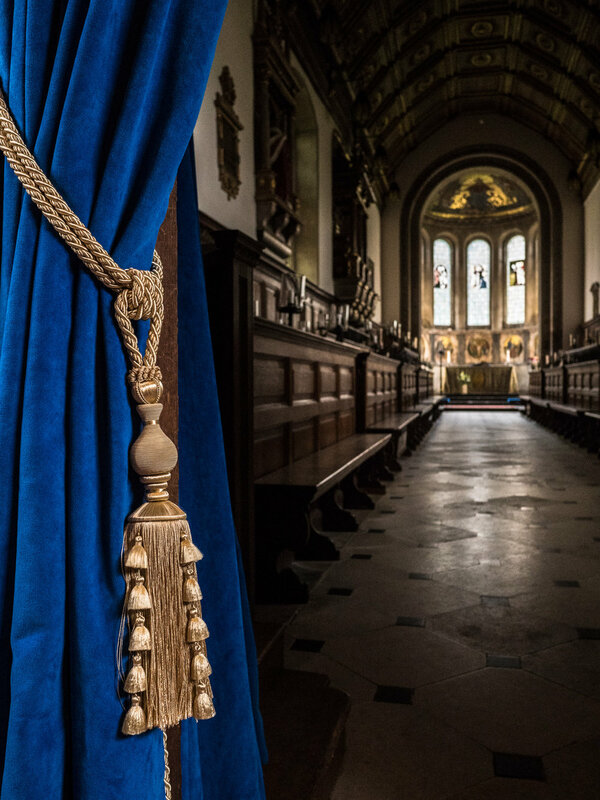 The low light levels in the chapel were the perfect for me to test the G9's in camera stabilisation and I found it, frankly, astonishing. I discovered I was able to take pictures at 1/5 of a second without camera shake - that's much slower than I've ever managed before! I also tried cranking up the ISO and found improvements over my GX8 there too. While it'll never be as good a full frame camera I'd be happy to shoot at ISO6400 if need be and that's plenty high enough for most situations. I hand held this at 1/5 of a second - that shouldn't be possible! One of the innovations I was particularly keen to try out was the G9's High Resolution mode. With this mode the camera's sensor moves inside the camera, shooting eight frames in quick succession, each slightly displaced by a small amount. The camera then glues all of these together, resulting in an 80 megapixel picture with much more detail. Not bad for a machine that's only got 20 megapixels to start with! Obviously the camera itself needs to be completely still so I grabbed my tripod and gave it a try. On importing the photos into Lightroom I wasn't wildly impressed. However, once I'd exported a JPG file it was possible to zoom further into the photo and maintain clear detail. I'm not convinced I've perfected my technique with this tool yet but I'm keen to try it again soon. The level of detail in this High Res picture won't be obvious online but it's really quite impressive in person! By the time I'd left the chapel I was pleased to see some really useful improvements over my two year old GX8. The additional stabilisation will be really useful when I'm shooting badly lit music events and should be really handy when shooting with long lenses. After some lunch and a good read of the user manual I set out onto the streets of Cambridge to try a little street photography. The light was deeply underwhelming but the camera acquitted itself well and I think I had more successes than usual in terms of accurate focus. Finally I wanted to try out the main feature I bought this camera for - tracking moving subjects. Obviously there were no sports cars or aircraft speeding through Cambridge so I had to make do with some more sedate cyclists instead! Again, the dreary light didn't do me any favours but I quickly realised the G9 is a huge improvement. I never got the focus tracking mode to work successfully on my GX8 but after a couple of minutes of practice I was already getting some keepers on the G9. There are many settings to be tweaked to perfect things but I can see it's likely to be a great tool for shooting moving subjects once I've learnt more. Not the speediest of subjects but a handy way of trying out the focus tracking!